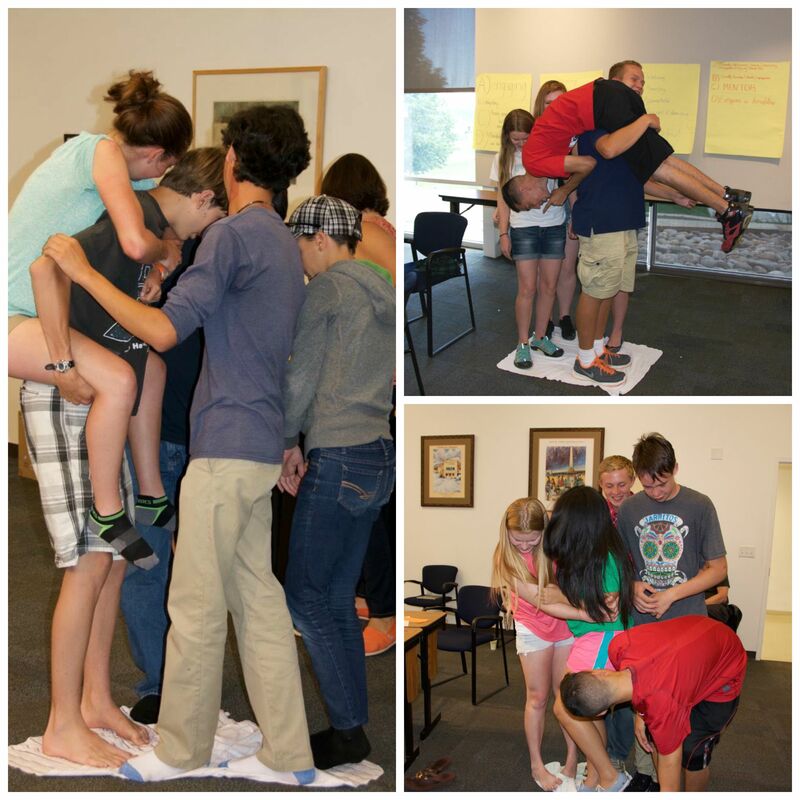 Teens get creative when space is cramped! While collaboration among adult mentors across multiple sites within a TSCN node is important, it is also important to build a sense of camaraderie among teen leaders from different sites through which they can share ideas and create a support network. Cross-site collaborations among teen leaders can enrich their professional development by adding variety to training opportunities, while increasing interest and retention. Here in St. Louis, the Saint Louis Science Center and the Academy of Science-St. Louis have begun holding joint professional development sessions for the teens to build camaraderie. We have had one such session focusing on consensus-building and another on communication skills. A third session scheduled for this fall might be centered around technology and using social media to expand the reach of the science cafés. During the training, we provide snacks for the teens and do an icebreaker. An adult mentor leads professional development activities for about an hour, and then each group splits up to plan their next café. We have found that this model gets the teens to intermingle more than they do at café dry runs. In addition to joint professional development sessions, we are planning an End-of-Year Hangout for our teen leadership teams. We are looking at an outdoor educational site called The Audubon Center at Riverlands, which is a major migratory stopover for many bird species along the Mississippi River. The teen leaders will have a chance to get outside and have some fun while learning about the environment. We will also be including a professional development session around using Google Hangouts and having the teens participate in a focus group. An added bonus for this End-of-Year Hangout is that all three sites in the St. Louis node will be able to attend. This is usually not the case with our joint professional development sessions because our third site, Cahokia High School, is a long distance away from the other two sites. Finally, this event will be a great send-off for the seniors who won’t be returning next semester. Teens often enjoy themselves more when they are with a number of other teens, and combining teen leaders from our sites increases the numbers at our planning meetings and other events. The excitement level (and noise!) dramatically increases when we hold joint professional development meetings. While we have not done a formal assessment of these joint sessions yet, initial feedback from the teens indicates that they do appreciate the chance to work with other teens in addition to receiving training in skills such as communication. They have also offered suggestions for future joint sessions, such as resume-writing. We hope to continue these joint professional development sessions and building camaraderie next year.